Smartsheet makes it easy to share important documents and conversations, keeping them in the context of your team’s project or process. Let Smartsheet help your team work together more efficiently and stay current on all important communication and records. 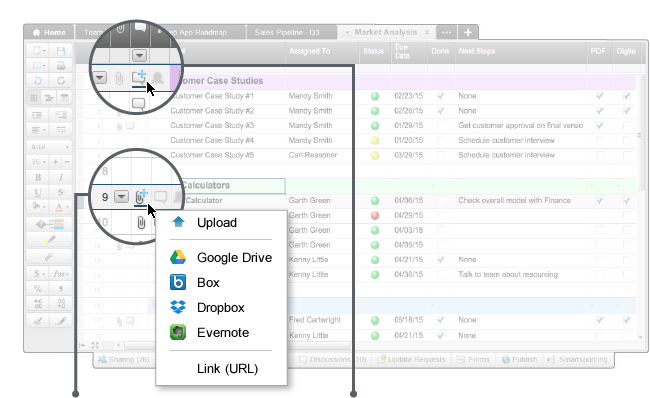 Smartsheet enables you to centralize and collaborate on all pieces of your project. Attach files - documents, PDFs, presentations, graphic files, and more - along with free-form notes and threaded discussions to any row. With Smartsheet, you can easily set automated alerts to remind you (and others on your team) about upcoming tasks and approaching deadlines. No more worrying if you’ve remembered all the details. 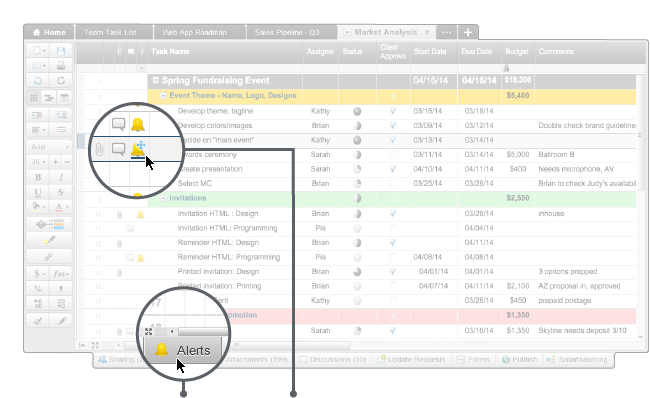 Smartsheet can send you notifications via email when other people make changes to a sheet so there are no surprises. You determine who receives the notification, how often, and based on what criteria. Setting automated reminders and notifications not only keeps you on task, it helps you streamline and simplify the work process. Getting things done has never been this easy.